A powerful heart healer, this essence provides protection for the highly sensitive who long to transcend their earthly pain. It creates an inner temple for serving the world from a place of pure Divine Love and is a stepping stone to higher realms. 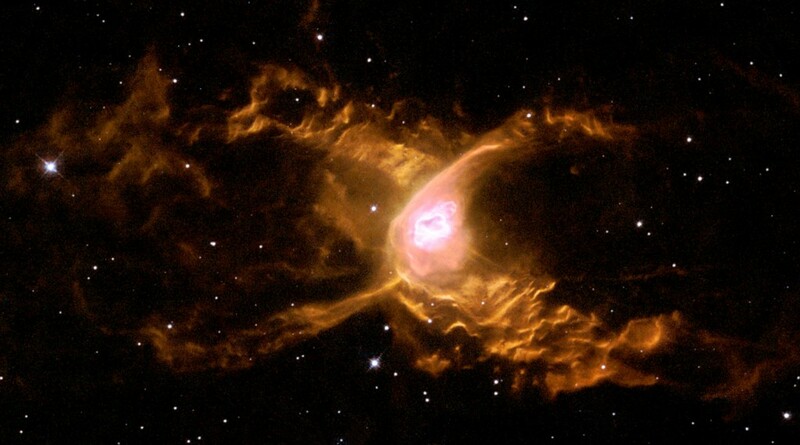 The Red Spider Nebula. Some of the most stunning sights of the cosmos are planetary nebulae. These are nothing to do with planets, in fact, but instead are glowing clouds of gas ejected by dying stars, and lit by the star’s own radiation. The Red Spider Nebula is an especially beautiful example, with tendrils of orange and gold gas reaching far into space, and a glowing pink and white centre. Given the pink colour, and indeed the shape of the centre, it is no surprise that this essence deals primarily with the heart. It creates a strongly protected pure space away from the pain of the world, a temple in fact, for the heart to operate in. It allows a crystalline structure of love to form within the heart, which then radiates out through the blood vessels to the rest of the being. This shape – a dodecahedron – creates a framework for energies descending from higher realms to fill the heart area, allowing one to operate from a place of the knowledge of pure love. This essence works best when a great deal of heart healing has already been achieved, for it is the ‘crowning’ of the process. Once the heart temple is established, it connects to the crown and opens up a clear view of the heavens. It promotes an inner willingness to use one’s creativity in spiritual service, and this then becomes a true delight, to serve in the service of God and angels and all higher powers. But the structure of the nebula shows that there is more to this essence. The protection that it brings to the heart allows one to feel safe, rather than threatened by the outside world. From this state, one can venture outwards, progress further in any direction, in any endeavour. It allows a breaking through of the barriers of inner resistance, into exciting new realms, which may have been considered too scary before. For those who are ready to, and need to, it can extend the psychic talents, onwards and upwards, enabling an opening up to a much wider frame of reference.